When you’re afraid of running out of hot water, life is miserable. If you have any of these thoughts you may need to call someone about water heater repair in Greece NY. You feel like maybe you shouldn’t wash your clothes, clean your dishes, or take a shower, because you never know when your hot water might disappear. You feel the need to make it last as long as you possibly can, so you can hope it will be there whenever you need it. Instead of playing games with your hot water and trying to make it last, you can call us! 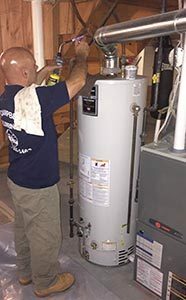 We would love to come out, look at your water heater, hear more about the problem, and figure out if you need water heater repair in Greece NY. After all, we understand that you need hot water to live your best life, and we’ll work hard to get it for you quickly and efficiently. Don’t Run Out of Hot Water! Maybe you aren’t sure if it’s worth calling a plumber in Greece NY for the hot water problems in your Greece, NY structure. After all, you don’t want to call someone out only to have them tell you that they can’t fix it or, even worse, that there’s nothing wrong. However, we respect that you know how your house should run and how you need it to run. If it’s not working for you, we’re on your side and we’ll help you figure out a solution to your problem. Your hot water disappears and you can’t get it back. Your hot water heater may need to be repaired or replaced in order to get hot water flowing again. Your hot water becomes lukewarm. If you feel like your hot water used to get hotter, you may not be wrong. First, check the temperature settings on your water heater. If these are where you want them to be, call us. We’ll come out and determine why your water heater isn’t heating the way it used it. Your hot water doesn’t last. If you used to be able to take a long, hot shower and now you run out of water part of the way through, call us. We’ll figure out why your hot water heater isn’t making as much hot water as it used to and get things working so you can have your relaxing showers again soon. Your hot water is intermittent. Sometimes, hot water seems to come and go at random. One day you will have it and the next day you won’t. If that’s happening for you, we’ll come troubleshoot your water heater. We’ll figure out what is causing the on-again, off-again hot water and make it run steadily for you again. You shouldn’t have to live with a water heater that isn’t meeting your needs. If you want more hot water, consistent hot water, or you’re having another issue, our expert plumbers will get things taken care of so you don’t have to worry anymore. We want you to be happy in your home, and we’ll work hard to get you there.